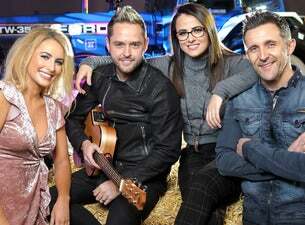 The Farmer's Bash returns to Belfast’ SSE Arena in 2018 featuring a who’s who of country stars including Derek Ryan and Lisa McHugh amongst many others. 2017's Farmers Bash was sandwiched between shows from John Bishop, The Ulster Orchestra and Neil Diamond making it the ultimate farmers’ night out. The atmosphere at the SSE Arena was electrifying with a close to capacity crowd filling the tiered seating and dance floor. They came from all over Ireland and Scotland as well as country fans from North Down and South Belfast; places and residents not ever associated with country music and all its trappings. On arrival at the main door, it would have been easy to confuse the scene with that of the Balmoral Agriculture Show and the array of expensive gleaming John Deeres and New Hollands that adorned the front of Arena. It really was a boys and their toys night out. There was even a £150,000 combine harvester on display for the lads to ogle at when the stage area was undergoing a band changeover. The Farmers Bash was the brainchild of promoters Nigel Campbell and LSFX Productions supremo Darren Gardiner, both no strangers to running big events. To some it was considered a gamble taking country away from the local community hall and marquees for one night. So much was the experience and feel good about the event that the country –cousin city slickers turned out in their thousands to give the boys from the country a run for their money on the dance floor; many even wearing the custom garb of check shirt, stone-washed denim and tan boots. The scale of the event was not something the regular Irish country music fan had witnessed before with super trouper spot lighting, pyrotechnics, confetti cannons, camera jibs and a video screen the size of a bungalow adorning the stage. The Farmers Bash has raised the bar for country and put the favourite social outing for thousands firmly on the map in Belfast. Next October 12th 2018, the organisers will repeat the event in the SSE with the promise to increase the scale of the production and line-up. Speaking at the launch in the Grassmen’s headquarters in Ballymena, promoter Nigel Campbell said: They were overwhelmed by the reaction to the show. “We were all slightly anxious about the event when we first put the tickets on sale but within an hour, over 2000 had been snapped up. We really couldn’t believe the reaction”. Grassmen chief Gareth Gault, whose company partnered in the promotion of the event, said he knew country music had a huge following but was amazed by the interest shown in the event. “We first started promoting the event at the Balmoral Show last May and after having a pictures taken on the The New Holland on our stand all the talk was of the Farmers Bash from young and old like”. The line up for the Farmers Bash 2018 is Derek Ryan, Lisa McHugh, Johnny Brady, Cliona Hagan and special guest Philomena Begley. ‘Cotton Eyed Joe’ chart toppers Rednex are jetting in from Sweden to perform an exclusive set.